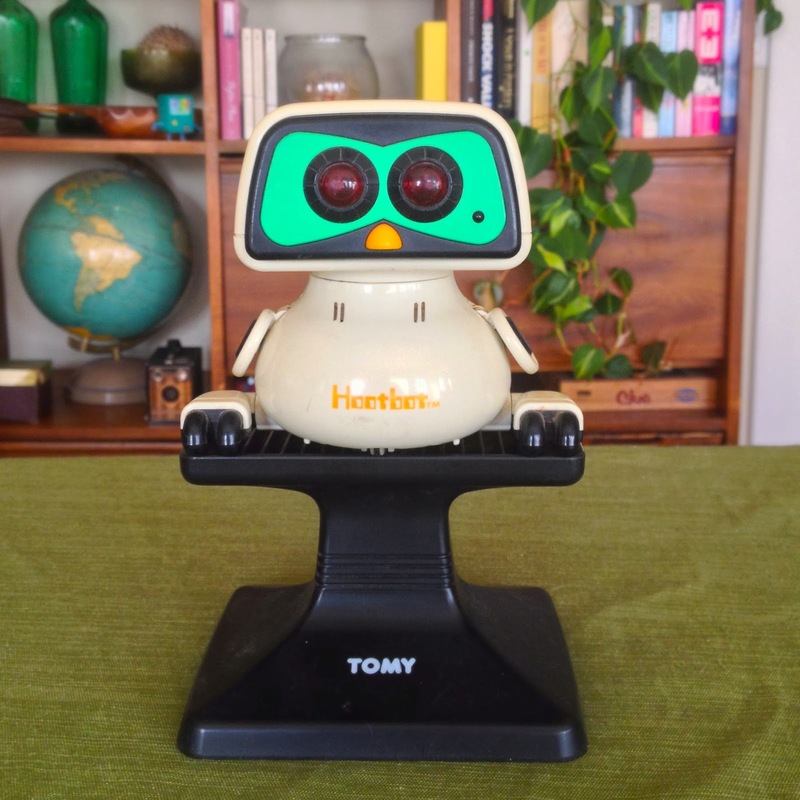 Years ago, I posted here a simple question: “Why Don’t I Already Have a Tomy Hootbot?” At the time, I’d just learned that these robot owl… things were produced in the ’80s by Tomy, the Japanese corporation best known for those dinky handheld video games but also Giga Pudding (apparently). And yeah, it seemed like I should own a robot owl. Why shouldn’t I? So when this Canadian guy tried to Google around about the Tomy Hootbot he found, he ended up on that very post and consequently emailed me asking if I’d like to buy his Tomy Hootbot. It still seemed like I should own a robot owl, I guess. Again, why shouldn’t I? No, it whistles shrilly at random intervals. Does it fly about the room? No, but it shakes its sideflaps, producing a plastic-on-plastic clicking sound. Does its neck swivel in a humorous fashion? No, it turns on par with how most humans can turn their necks. Does it prey on mice and other rodents? No, I have just as many mice now as I did before I got the Tomy Hootbot. It clicks its toes against its pedestal. Is that… something owls do? I really don’t know. But I don’t think so. It’s certainly not something they’ve become famous for. But it’s a robot. Does it, like, fire lasers from its eyes? Its eyes glow red, but alas — so far, no optic lasers. I heard owls are often associated with wisdom. Does the Tomy Hootbot seem wise to you? Are you at least glad that it was the Tomy Hootbot that you ended up getting as a result of this blog and not the Otamatone? Yes, I suppose that is the bright side here. So how has the Tomy Hootbot changed your life? Why do you keep saying the full name, “Tomy Hootbot”? Well, now no one can tell me that I don’t own a robot owl. That’s something no one will ever take away from me — unless they specifically steal my Tomy Hootbot. Yes, BMO tends to move when I'm not looking. I actually own an otomatone and I imagine that your Tomy Hootbot will get about as much use as my otomatone does. I was wondering if I heard about it from you, so I clicked the link and saw that I did in fact post on that page, which made me realize that I've been reading this blog for about four years, if not more. How time flies. Wait... it what? Must examine immediately. Okay, I have attempted this on a variety of surfaces. He does not walk. Perhaps his walking mechanism is broken? Mine has wheels too, though I’ve found that I need to provide very specific circumstances if I want them to work properly. also, when I was posting that comment I was asked to verify that I was not a robot, so I made sure not to whistle or click my toes. I have a hootbot, and it's the only thing I've made sure I've kept throughout the years. He doesn't work anymore but hopefully I'll find the right person to fix him someday. I will never be without my hootbot and I'm passing his legacy onto my kids. I would buy more if given the opportunity.